honey – Damn, I Can Make That! Yeah, yeah, I know we’ve been giving you a lot of drinks lately, but lesbehonest. There’s always room for drinks. And with fall right around the corner (although it may not feeeel like it) you need a couple of cozy drink options. In a pan on a medium heat add all the ingredients. For the ginger, squeeze the grated pulp so just the juice is used in the latte. Discard the pulp. Heat until just before boiling whisking all the while for about 6 mins. Serve immediately. I recently bought a TUB of coconut oil. Completely by mistake, mind you. That’s what happens when you late-night shop on Amazon. Anyway, I’ve managed to use it for a couple of things – chapstick, moisturizer, hair mask. However, I’ve been a bit nervous about trying it out in food. I don’t necessarily want my eggs to taste like coconut by using it as an oil. Luckily, I came across Anna Eastick’s blog Heart+Bowl. She has super healthy bowl recipes like this drool worthy chocolate mousse recipe, with coconut oil! 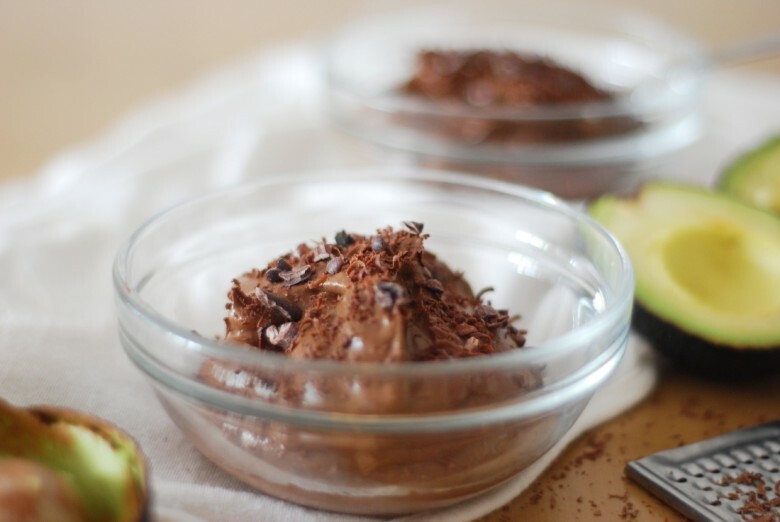 I’ve been seeing avocado mixed with chocolate for a while now, so it’s about time we give you a damn delish recipe for it. In a food processor, purée the avocado until smooth. In a jug, combine the cocoa powder and milk until a smooth paste forms. Add the cocoa and milk mixture to the avocado, along with the remaining ingredients. Blend everything together until smooth and well combined. Transfer the mixture into individual bowls and chill in the fridge until ready to serve. Top with grated bittersweet dark chocolate and sprinkle over cocoa nibs. Preheat your oven to 350 degrees. Place the bacon on a baking sheet/jelly roll pan and cook for 20 – 25 minutes until slightly crispy but not fully cooked. While that’s making your house smell amazing, in a small saucepan bring the maple syrup, honey, and mustard to a boil. Reduce the heat to medium and add the beer. Simmer the mixture for 5 minutes. 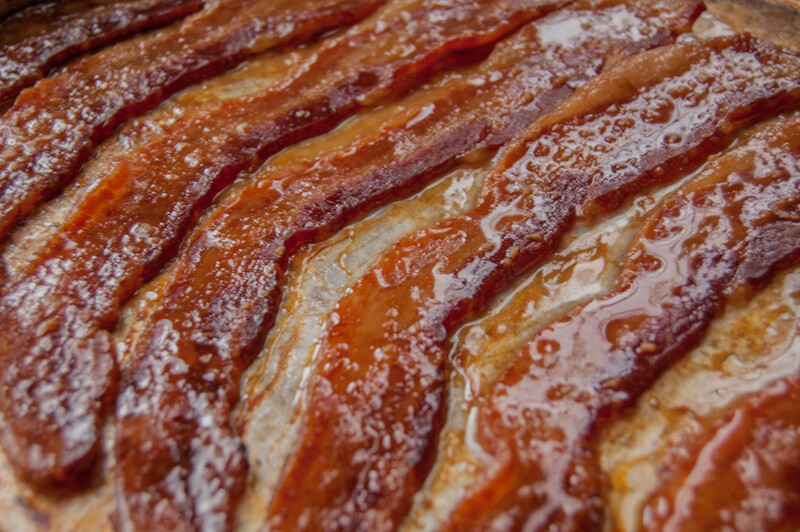 When the bacon is done, pour the maple mixture on top creating an even layer on each strip. Cook the bacon for 5-10 more minutes depending on how crispy you prefer it. Fall produce is my favorite! 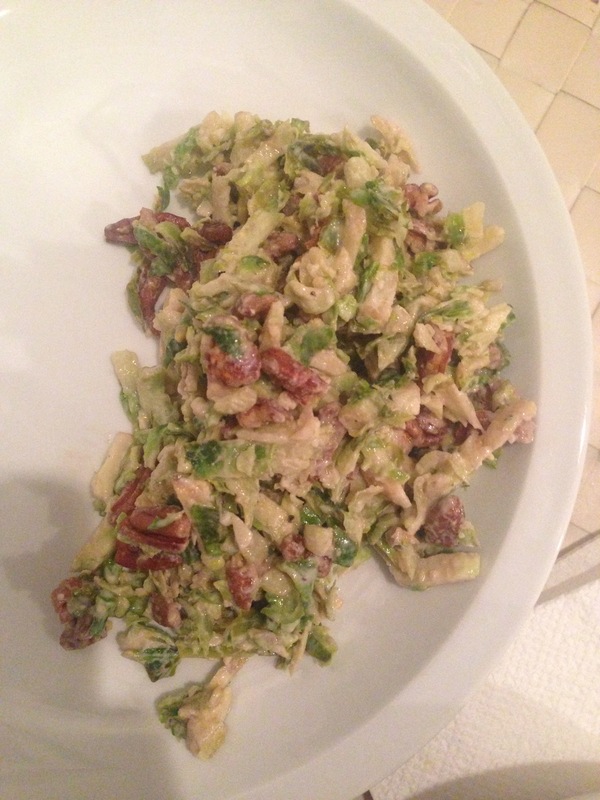 The veggies are just amazing and although most people associate salad with Summer, Fall has some legit salad options. This one is great with some pan seared chicken or fish as a meal, or can be great as a side. Let’s face it, you have to eat some lighter meals in the cooler months to offset the casseroles, desserts, comfort foods, etc. Hope you enjoy the dressing & can use it on multiple salads, like a cold noodle one like good ole Chrissy Teigen makes on her blog. Because who doesn’t want to eat, act, look like her! haha. Guys, I’m having a love affair. With honey roasted nuts. I don’t know if it’s the countless times I’ve smelled them in NYC or because every one of my Blue Apron orders has them, I’m loving them right now. And the fact that they’re easy to make and relatively healthy is a total bonus. Whip them up right before company comes so the house smells good and you have something to snack on. Set your oven to broil and grease a medium sized cookie sheet. 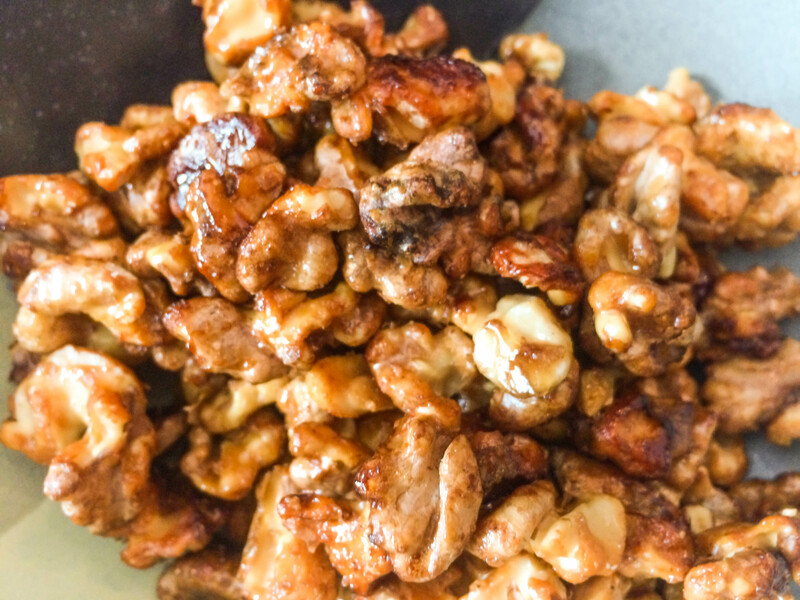 In a large bowl, mix together the walnuts and honey until fully coated. Spread the coated walnuts on the cookie sheet and sprinkle with cinnamon, salt, or whatever your creative mind comes up with! Roast the walnuts for approximately 15 minutes or until they begin to brown. Serve hot for a little NYC flavor, or they can be wrapped and stored for a couple of weeks.